BOYCE, La.--(BUSINESS WIRE)--Six new group homes for developmentally disabled adults with severe or profound intellectual abilities will be built thanks to a $450,000 Affordable Housing Program (AHP) grant from Red River Bank and the Federal Home Loan Bank of Dallas (FHLB Dallas). The grant was awarded to St. Mary’s Residential Training School (St. Mary’s) during a check presentation and ground breaking yesterday with representatives from the organization and both banks in attendance. Each group home will contain eight individual living areas in addition to a laundry facility, community room, kitchen and handicap-accessible bathrooms. The $9.5 million project will eliminate dormitories on St. Mary’s campus and transition more than 120 residents from a congregant living environment to a true home of their own. Vice President of Community Relations and CRA Officer at Red River Bank, Jannease Seastrunk, said there are many benefits to the AHP. “The Affordable Housing Program is not just a valuable community investment tool, but also a conduit through which we can provide value to our customers and make a positive impact on the community,” said Ms. Seastrunk. AHP grants, awarded annually by FHLB Dallas, assist members in the creation or rehabilitation of affordable, owner-occupied rental and temporary housing for very low- to moderate-income households in FHLB Dallas’ five-state District of Arkansas, Louisiana, Mississippi, New Mexico and Texas. In 2017, FHLB Dallas awarded $7 million in AHP grants to 19 projects that will result in 1,108 new or renovated housing units. Of that, $1.7 million was awarded to Louisiana projects, and will result in 113 new or rehabbed housing units. Visit fhlb.com for more information on the 2017 AHP awards. “The AHP is a powerful community investment tool because it benefits the community in various ways. 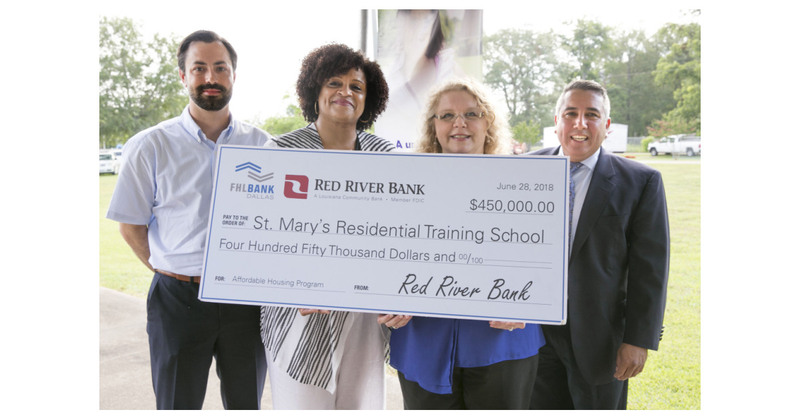 We’ve partnered with Red River Bank on a number of projects over the years, and they have demonstrated a continuous commitment to supporting affordable housing options in the communities they serve,” said Greg Hettrick, first vice president and director of Community Investment at FHLB Dallas.